Classic Army is a leading manufacturer of Airsoft products, setting standards for the entire industry. This model of the ECS MSG-90 will ship directly from the manufacturing center. Additionally, ECS MSG-90 is priced lower since the product is coming from Hong Kong! This is literally one of the best deals on Earth considering the package can ship to any country where its legal. It's time to get your hands on this affordable deal coming straight out of the factory! 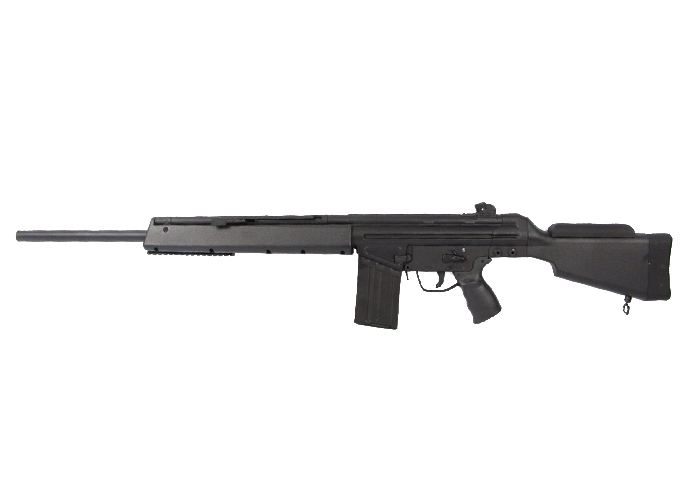 The Classic Army Full Metal ECS MSG-90 Rifle is another great design in Classic Army's series of G3 style airsoft guns. The ECS MSG-90 was made famous with the long service it saw in the German Army and around the world for many years. The ECS MSG-90 Rifle has full metal construction and a laser etched logo with serial number under license with CA. It also replicates the action of the G3; pull back the charging handle and the bolt cover retracts to reveal the hop-up adjustment. The front and rear sling mounts allow the user the addition of a sling. The ECS MSG-90 features an integral folding bi-pod. The long barrel length and the full stock of the G3 make it great at long ranges and extended outdoor games. The ECS MSG-90 is the first platform outside of M4's to come pre-installed with Classic Army's tried and true ECS! With the ability to program your fire modes and super snappy trigger response, the ECS MSG-90 is ready to dominate any field it finds itself in! The "Factory Direct" option might not be the best, for larger or more Niche airsoft guns. Very minimally packaged. The Zip ties securing the gun to the foam insert had sheared through the foam, and the stock managed to get cracked sometime during shipping. The front of the barrel impacted the side of the box so much there are permanent dents in the cardboard. The orange tip even "bonked" itself off during transit, so I guess that's nice. The outer barrel is 2 piece. Orange Tip is very easy to remove. The excess glue boiled off with very minimal effort. Came with an extra piston and gearset (OEM Replacement) since it has no Warranty. Wired for Small Tamiya, decription said Deans. The Magazine well is temperamental. The 500 round hicap that came with it fits perfectly, but the two other Classic Army highcaps I ordered require a brisk "slap" to ensure they've seated. Minimal packaging material. Might be OK for smaller guns, but mine arrive damaged. Since sold cheaper and "Factory Direct": No Warranty. Length and inside diameter of barrel? What is the total length of the inner barrel and its inside (bore) diameter ? it should be a 509 mm barrel.